The Sun Rise Burger at On Tap Grille takes my favorite combination of bacon cheeseburger with a fried egg one step further. They add ham too! I of course got mine with BB@ sauce on the side, because that it the preferred topping for such things. So Good It Should Be Outlawed! And I’m sure Panini’s had that in mind when they crafted “The Outlaw”. 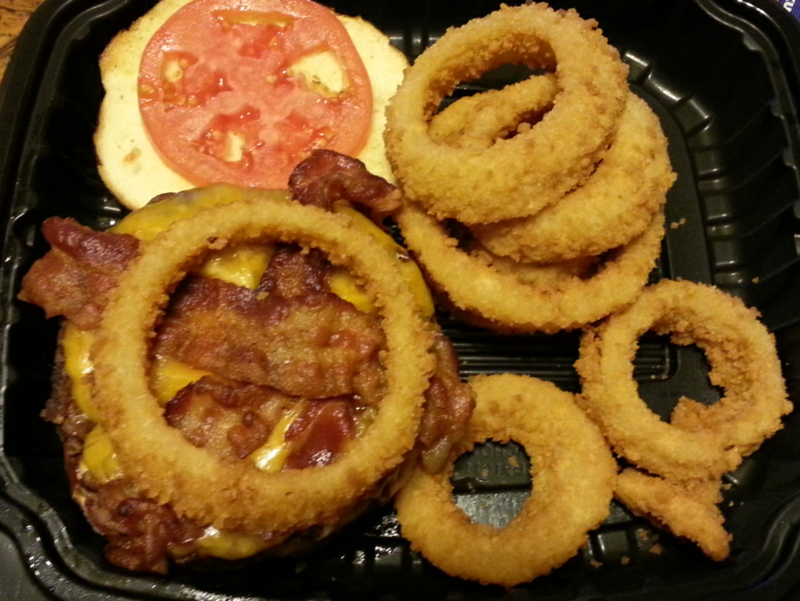 Smothered in our Mesquite BBQ sauce & topped with melted cheddar, Applewood bacon, onion ring, shredded lettuce & tomato. Now I skipped the lettuce (imagine that) and got it on a pretzel roll just to be different. Got onion rings on the side instead of the standard chips as well. As you may have noticed from the fancy plate, I had it delivered. Can’t say either their chips nor their fries make the trip very well. The onion rings, on the other hand, travel just fine. For some reason the pretzel roll, which I typically really like, just didn’t seem to add to this combination. Almost too much. Maybe off set the Mesquite BBQ? Can’t put a finger on it so I feel obligated to order it again on a different bun to compare and contrast. In fact, I feel I need to try it on every bun option available to be completely fair about it. 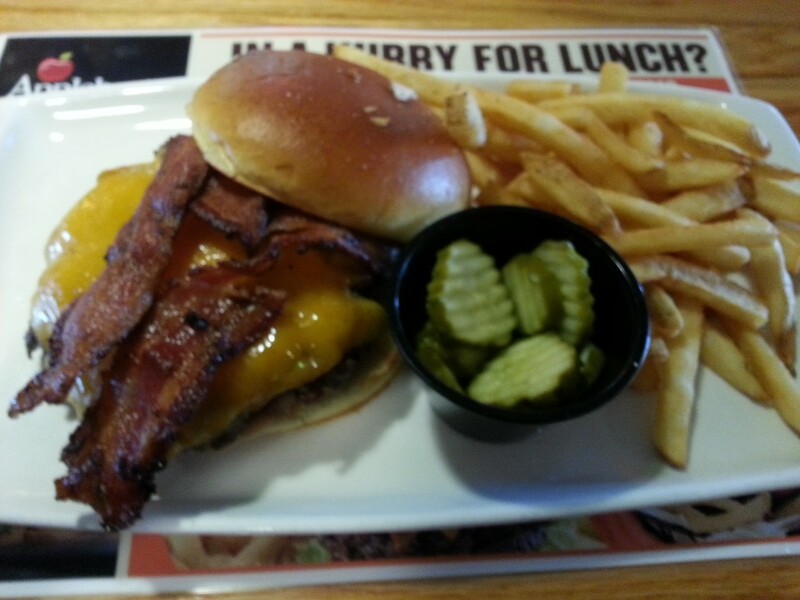 At @Applebee’s the Triple Bacon Burger is not a triple stacked bacon cheeseburger, as you might expect. 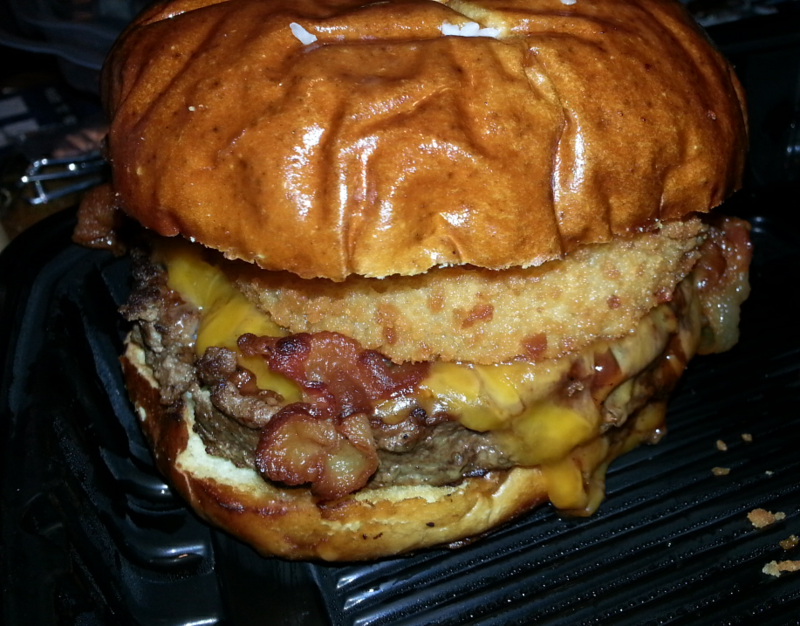 Rather it is a bacon cheeseburger with triple the bacon. Well, not actually triple, but they do trump the typical slices of bacon on top by also cooking bacon into the burger and including a bacon ranch sauce underneath. First take? 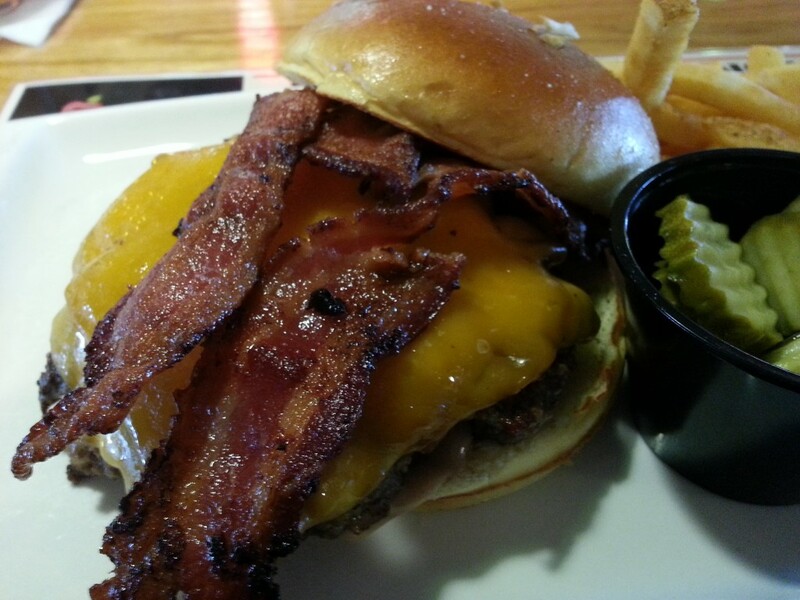 It’s a good bacon cheeseburger. 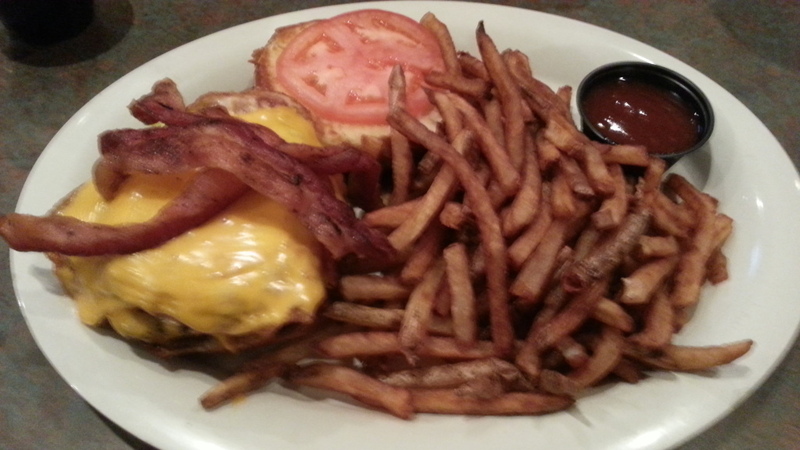 I like the bun, the bacon was tasty, cheddar a good choice of cheeses. It did not seem as overwhelmingly bacon as I might have expected, or even hoped for though. The bacon ranch sauce was either too mild, or forgotten, as I really didn’t notice it at all. What this all means is that I have to try it again. Did my stacking excessive pickles on my burger take away from the bacon flavor? Should I have asked for extra bacon ranch sauce? I will be sure to update this review with the answers to these questions, and more…. 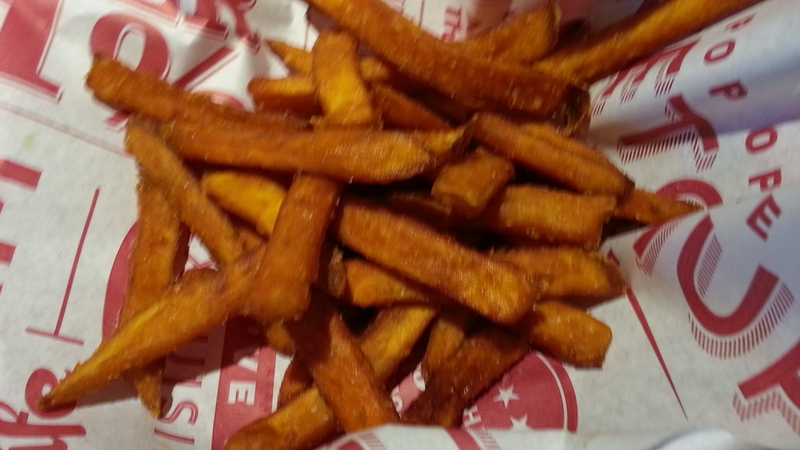 Yes, Red Robin Gourmet Burgers is a rather pretentious name for a burger chain, but I ask you to set aside any preconceived bias you may have and give this uniquely delightful offering a try. 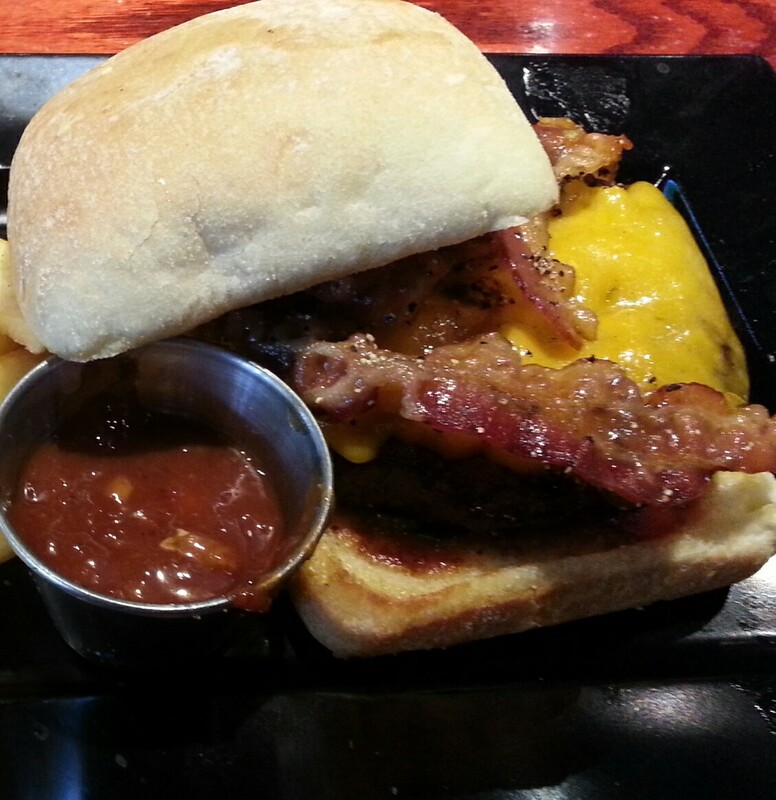 The Smoke & Pepper Burger is not your father’s Red Robin burger, that while good, was also comparable to so many similar chain establishments. 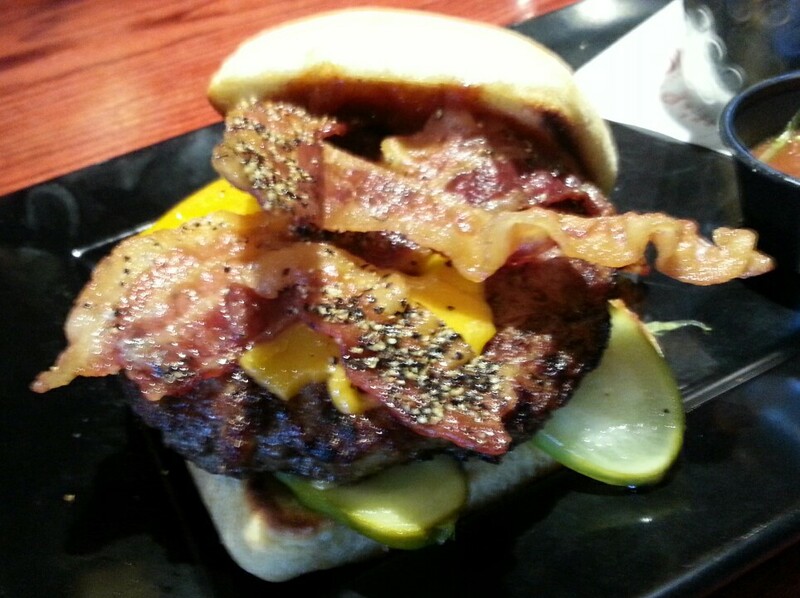 No, the Smoke & Pepper Burger is a bacon cheeseburger with a twist. A few in fact, and all fit perfectly together. From the sharp cheddar, heavily peppered bacon and unique spicy ketchup to the for once appropriate use of a ciabatta roll, it supplies a truly unique experience. 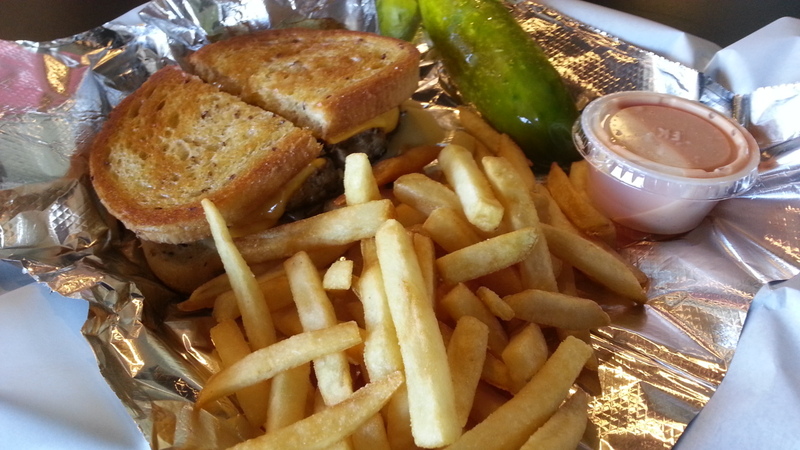 Now maybe it just happens to be the exact combination of flavors that thrills my tastebuds most, or maybe you will also be delighted with this true Gourmet Cheeseburger. I had an all around exemplary experience, with a surprisingly delightful meal and and an equally pleasant waitress. Kim was perfectly attentive, sincere and friendly without being pushy or overbearing in any way. 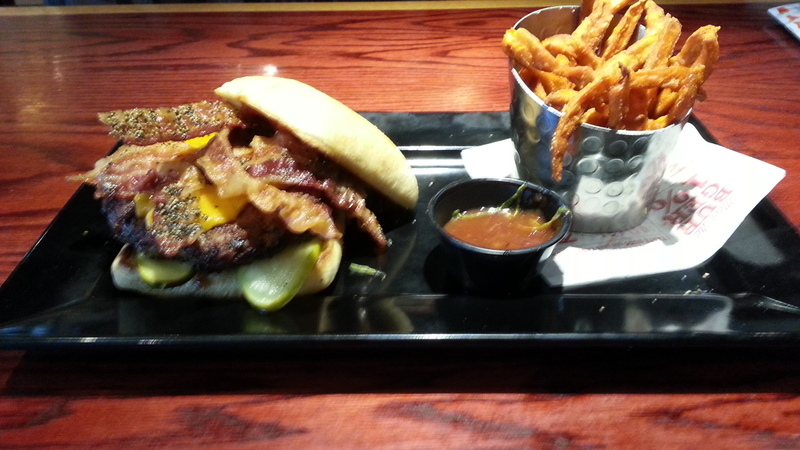 I will make a note to ask for her section when I next visit Red Robin for another Smoke & Pepper Burger. 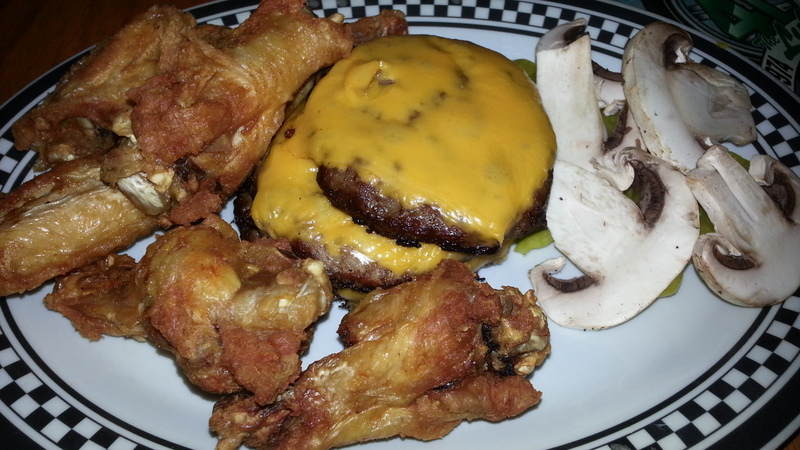 Torn Between Pizza and a Cheeseburger? @HungryHowies lets you have both at once. 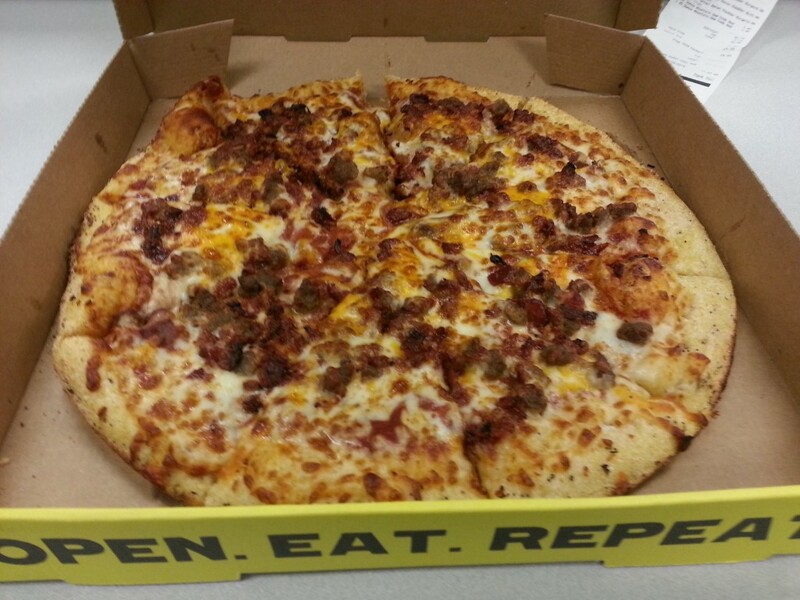 Check out their Bacon Cheddar Cheeseburger Pizza and enjoy the best of both worlds. 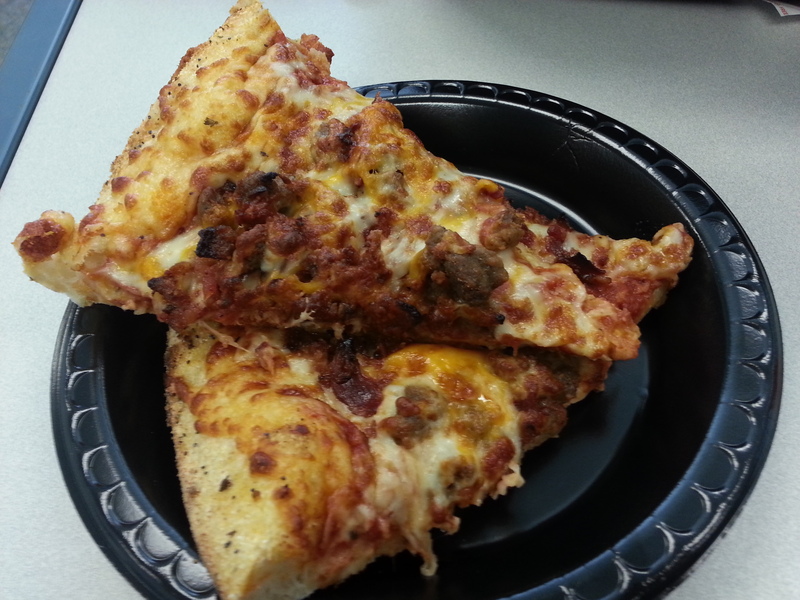 They offer a variety of flavored crusts, but the Onion is the perfect match for this treasure. Much like a bacon cheeseburger on an onion bun!